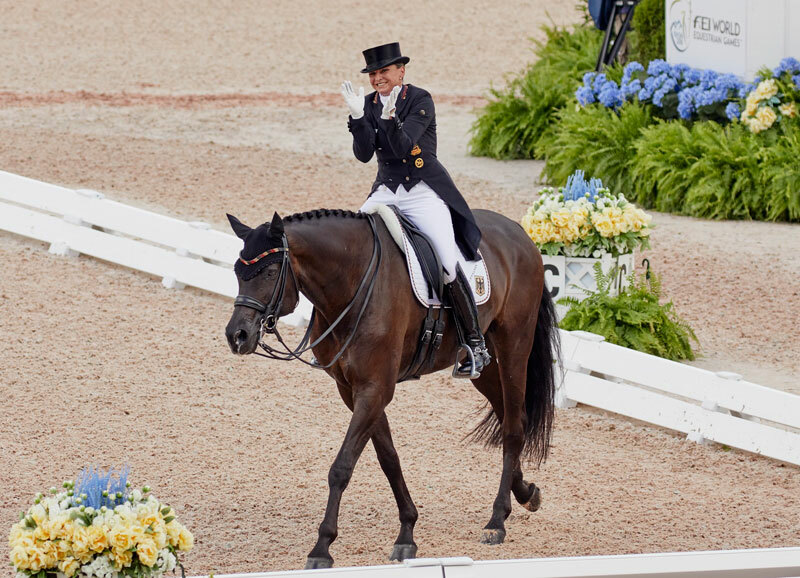 Germany took the lead after the first day of Team Dressage at the FEI World Equestrian Games™ Tryon 2018, but the defending champions have only a narrow lead over Sweden in silver and the USA in bronze medal position when the battle resumes in the morning. This halfway result is based on the best individual score for each team in today’s Grand Prix, so there is plenty of room for dramatic change before the podium places are decided. “I watched the first two horses from up in the stand with my brother Benni and I suddenly got the shivers and felt motivated because I realised how many other people would like to be in my shoes! So I went in there feeling full of power and Delera was just brilliant,” said Von Bredow-Werndl. “I’m specially pleased with him since we warmed up in a complete downpour and then it was blazing hot the next second – fitness is a big factor here. He’s a big dark horse and I did my best to get him as fit as I could, and I’m glad I did because it took every ounce of the fitness he had out there in that heat,” Lyle said. The Netherlands holds fifth place, Spain is in sixth and Denmark lies seventh of the 15 competing nations.